Cremnitz White in Linseed Oil | KREMER Oil Colors | Ready-made Colors | Kremer Pigments Inc. Concentrated - to be diluted, with SHELLSOL® T or turpentine. Contains lead! Toxic! Do not use for paint of objects which could be licked or chewed by children. Only permitted for the restoration of art works as well as historically protected buildings, only if the use of substitutes is impossible. 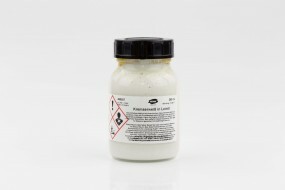 Chemical description Basic lead carbonate in linseed oil. Customer evaluation for "Cremnitz White in Linseed Oil"